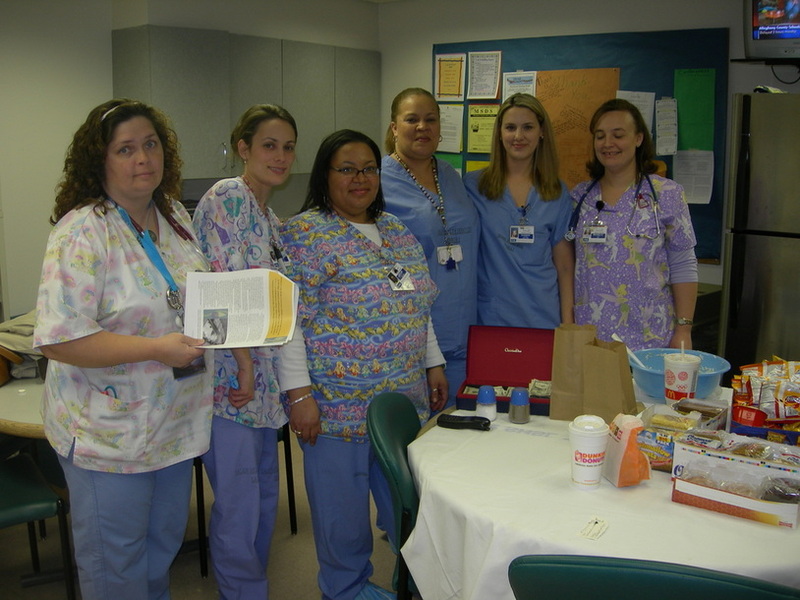 Forsyth Medical Center labor nurses conduct a night-shift hotdog sale to raise travel funds for Shelma Williams. Shelma is pictured 3rd from the left Shelma Williams has been a registered nurse in labor and delivery for fifteen years. She spent eight of those years at Forsyth Medical Center in Winston Salem, North Carolina. She initially became involved with Kybele after overhearing a conversation between Dr. Medge Owen, founder, and another physician at the hospital. Impressed by the mission of the organization, to prevent childbirth related injury and death globally, along with her passion for the neonatal field, Shelma knew that she was the perfect candidate for the Kybele team. She joined and attended her first trip to Ghana in January of 2007. “I was determined to go despite financial difficulties during that time. Along with my supportive coworkers, I began selling hotdogs and barbeque sandwiches at work. I petitioned family members, friends, church members, and other coworkers, and came up with the airfare for my trip to Ghana. My fundraising even allowed me to have spending money to take with me to Ghana,” Shelma said. She helped fill a critical need for healthcare providers in Ghana. The leading causes of maternal death are acute hemorrhage, sepsis, pre-eclampsia, obstructed labor and non-hemorrhagic anemia. Shelma realized that these numbers were astronomically high because the women needed to get into the hospitals to deliver their babies. They desperately needed sufficient medical attention, anesthesia, and treatment in order to save their lives and the lives of their babies. She discovered that she could use her skills to benefit others and gain a sense of fulfillment in her own life. “As an African American female nurse, I wanted to use my nursing experience to give back to those who are less fortunate, but not less deserving. I knew that I could teach neonatal resuscitation to the medical providers and thus improve the survival rate of the babies. I benefit from building a relationship with the patients, something that the physicians are unable to do because of time constraints. I also met new people and learned of stories that have had significant impacts on the women’s lives and my own life,”Shelma shared. Like many of the country’s healthcare facilities, the hospital Shelma volunteered at offered only basic accommodations. Sadly, many patients arrived at the hospital with conditions that required emergency attention. Shelma sorrowfully recalled one particular patient that lost her baby unnecessarily and the treatment she received as she grieved. “A middleclass woman was referred to the hospital where I was stationed because she was overdue and required a Cesarean Section immediately. It was her first pregnancy and her operation was scheduled for Friday, but it was now Sunday and she still had not been seen. When we finally got to her, I tried to find the baby’s heart rate, but could not find one. The woman and I had to walk almost half a mile to the other end of the hospital to obtain an ultrasound. When I informed her that the baby had no heartbeat, she was distraught, but did not weep. During her postpartum period, she sat on the floor with all of the other moms and their newborn babies. When a tear came to her eye, the midwives told her don’t cry because she could have another baby. It was cultural belief that if a baby did not survive, he was not strong enough to live. I was extremely disheartened and angered by what I saw,” said Shelma. At the end of the trip, Shelma left frustrated and angry because it was like nothing she ever imagined. Initially, she did not understand the culture nor did she see the people for who they actually were. Upon arriving back into the United States, it dawned on Shelma she was completely wrong in her thinking. Her outlook on life changed after that. Shelma continues to be an active member of Kybele. She hopes to increase the number of mission trips she attends per year as well as continue her networking efforts in support of Kybele.